Here is a tutorial about improving your cat photography. I truly hope this tutorial will be helpful... and that you'll like it. - I never take cat photos in studio and most of the time I use only natural light (outside, or throught a window when I'm inside). - All my cat pictures are hand-held photos (no tripod). - All the advice I give are good for animal photography in general. ... Don't hesitate to ask if something isn't clear ! Feel free to show me your work. Here is 's great work ! Very Good, I Hope I Can Take Good Pictures Too! wow! This is SOOO helpful! Thanks so much! Wow, extremely helpful. I might even be able to use some of this on my dogs. Thanks for making this tutorial. It's very clear , especially with the examples. I'll try to remember and apply your advices. Thanks for the tutorial. Perhaps it will inspire me to have another go myself. May I give you more advice for your photos ? 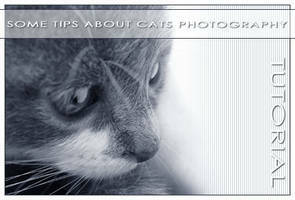 Wow, this is such a great tutorial on cat photography. You've put in just the right amount of technical detail and kept the reverence for the subject. It's wonderful. I'm going to go home and photograph my cats now. Le chat de mon frère est resté à la maison ce matin et j'en ai profité pour mettre à profit les conseils que tu donnes dans le tuto. Alors c'est tout à ton honneur ... et peut-être qu'à force de l'embêter pour le prendre en photo il deviendra moins peureux XD. Si tu me permets, j'aimerais rajouter ton travail dans le commentaire du tuto ! Aucun problème, sans ton tuto ces photos n'existeraient même pas alors n'hésite pas à en faire ce que tu veux ! Merci beaucoup pour le tutorial. J'aime beaucoup le point à propos des "non-cooperative cats" C'est vrai que parfois, lorsqu'ils ont décidé de ne pas se prêter au jeu, ils deviennent impossible (j'en ai un qui prend un malin plaisir à faire sa toilette à chaque fois qu'il me voit approcher avec l'appareil photo ). awesome tutorial, very useful advices! I'm honored I'll add it as soon as my week limitation will be over lol. We look forward to seeing it submitted. Thanks for the lessons. Cat are difficult to photograph and I end up deleting at LEAST half of the photos I take. I knew some of the tricks, and the *Rule of the thirds*, but I also got a few good information, and this is also a great reminder to look at before taking photos. Bien joué, un excellent tuto (que je mettrai en pratique dès que j'aurai un chat ^^') et une très bonne façon de faire une compilation de jolies photos de chats ! Aah, yes, I was looking at the options on my camera and I don't think I can The only thing I noticed that I /can/ possibly choose is the ISO. Otherwise, I have what is called a Dis Mode. Seems to work best if I don't want to use a flash and get a non-blurry image. I wonder if that is possibly the equivalent? I think the Dis Mode is only a stabilisation mode, it's not equivalent to the Av mode, but it will be really useful to get hand-held shots when you take cats in poor lighting. Aah okay. Well, one day I will upgrade and I'll keep that in mind! Thank you again for sharing! This is really good and interesting. I would definitely try these techniques with my cat By the way, great job on your English, and few words weren't appropriate in some sentences but overall...awesome job! 7 steps for taking better photos-beginner's guideHello and welcome to my little guide on how to make better photos*. *Photos that are technically correct; with little grain, right exposure, right composition, etc. So, some of you have probably gotten a new camera during the holidays and it's so shiny and look at all the details, is that a pore on my face, and everything is great, but what are all these numbers and letters on my screen, let's just use auto mode. And then it all begins. The depression. The photos lack something... That sparkle of life, you know. You ask why? Is this the way of god trying to tell me that I have no talents and that I wasted my money? You just need a bit of guidance, that's all. Here are some tips for beginners and those who might need it. It's safe now to turn off auto mode. What are you saying?! These are too complicated to understand, why should I?